Airbus has signed a Memorandum of Understanding with Lockheed Martin to market the Airbus A330 Multi-Role Tanker Transport (MRTT) – in service with the Royal Australian Air Force as the KC-30A – to potential US defence customers. A decade ago the A330-200 airliner-based KC-30, then offered by Airbus and Northrop Grumman, was selected in February 2008 to fulfil the USAF’s KC-X requirement for 179 tankers to replace ageing KC-130E/R tankers, the youngest of which entered service in 1962. But this decision was overturned on appeal by the US Government Audit Office (GAO), and the KC-X deal was subsequently awarded in 2011 to Boeing with its 767-based KC-46. More than a decade since the original award was overturned, more than 30 A330 MRTTs/KC-30s are in service with 12 operators around the world, while the KC-46 program has been plagued with development delays and the aircraft is yet to enter USAF service. 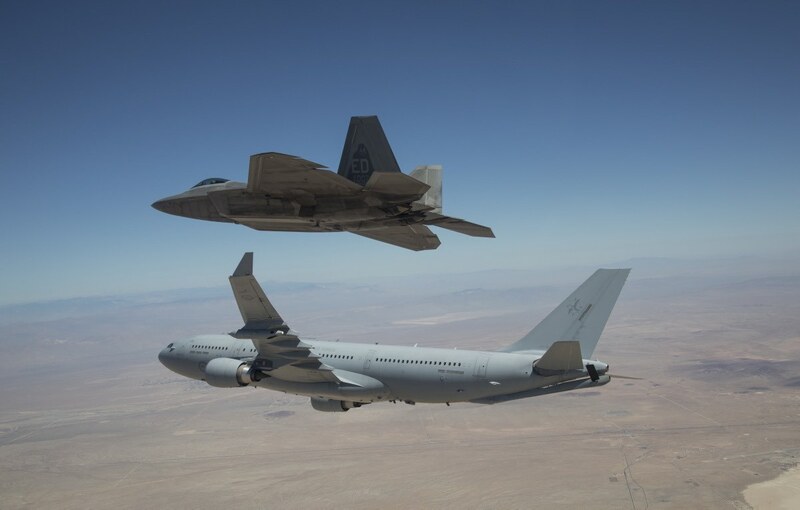 “Reliable and modernised aerial refuelling is an essential capability for our customers to maintain their global reach and strategic advantage,” Lockheed Martin chairman, president and CEO Marillyn Hewson said in a statement. It is unclear whether the Airbus and Lockheed Martin tie-up is being positioned for the follow-on KC-Y requirement which will replace additional KC-35s and possibly the larger KC-10 as well, or whether the partnership sees a smaller refuelling services market to augment the USAF’s fleet. “The A330 MRTT has been selected by a dozen nations around the world. It is extensively proven in live operations and has been repeatedly praised by major air forces,” Airbus Defence and Space Head of Military Aircraft Fernando Alonso said. So why, with project Sunlite or whatever marketing term has been allocated to it, why not inflight refuel passenger jets? There are no dumb questions, only dumb answers. Go on, ladies and gentlemen, show us convincingly why this is not safe and/or impossible. Make sure Alan Joyce, the QF shareholders’ friend and BS artiste, gets to read this. If QF really is so breathtakingly innovative, give the world a reason why not to do this. The military has always led the way (or the non-PAX postal serice…) so why not now? Simple. In flight refuelling is very expensive and uneconomical for a commercial operation. The cost of launching the tanker is the same sunken and operating cost of the receiver. The offloaded fuel fraction therefore is exorbitantly expensive. Thank you Michael. Very good point. I mentioned it just because it seems that QF is in an unseemly haste to do this ULH malarkey. I doubt they’ll have a full PAX load and no freight to soften the fare-blowout. Also, they may be flying an orphan fleet with little residual value, a future cost to be accounted for. I rather like my stopover(s), even in J class with flat-bed recliners. But point taken. Ah, the economics of it all! Thanks mate. Didn’t this happen a few years ago and Airbus won, only to lose to Boeing. Full circle…. Who doesn’t the US lease the A330 as a stopgap solution.this way they could be at least safe a great deal of fuel,. “179 tankers to replace ageing KC-130E/R tankers, the youngest of which entered service in 1962” . . . do you mean KC-135?